Drs. Carole Baldwin and Ross Robertson from the Smithsonian Institution discovered a new small goby fish that differs from its relatives not only in its size and colors, but also in the depth of its habitat (70-80 m) in the southern Caribbean. Their finding comes as a part of the institution's Deep Reef Observation Project (DROP). This is why the scientists gave it the name Coryphopterus curasub in recognition of the Curasub submersible that was used in their deep-reef exploration. Their study can be found in the open-access journal ZooKeys. Marine biodiversity inhabiting shallow Caribbean coral reefs has been studied for more than 150 years, but much less is known about what lives at depths just below those accessible with conventional SCUBA gear. 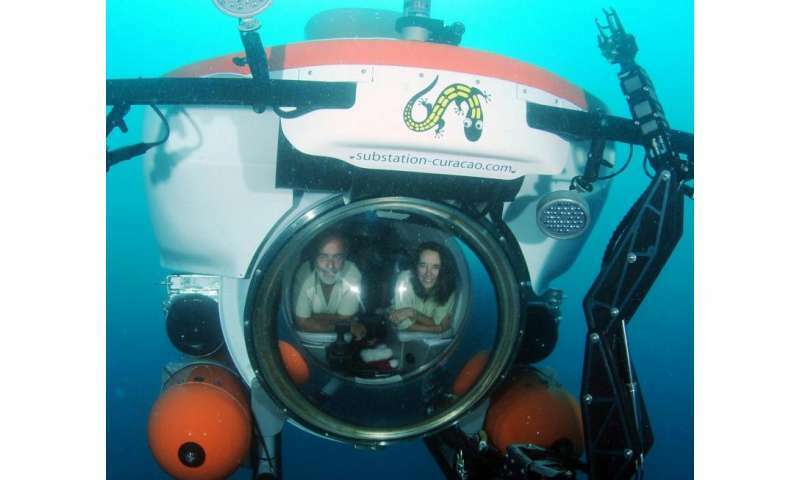 Thanks to the availability of a privately owned, manned submersible on the island of Curacao, the Curasub, scientists are now able to intensively study depths to 300 m (1,000 ft). "This is the fourth new deep-reef fish species described in two years from Curasub diving off Curacao," explained Baldwin, "Many more new deep-reef fish species have already been discovered and await description, and even more await discovery." She also pointed out that new species of mollusks and crustaceans have also been discovered, and a "biology bonanza" is highly likely as tropical deep reefs continue to be explored. In addition to the new goby species, the authors report on the collection of a related goby species some 50 m (164 ft.) deeper than it was previously known. Knowledge of species' upper and lower depth limits is information that Baldwin and Robertson are establishing for numerous fish species in the southern Caribbean, and in this study they tabulated and graphed depth information for the 14 known species of Coryphopterus gobies. 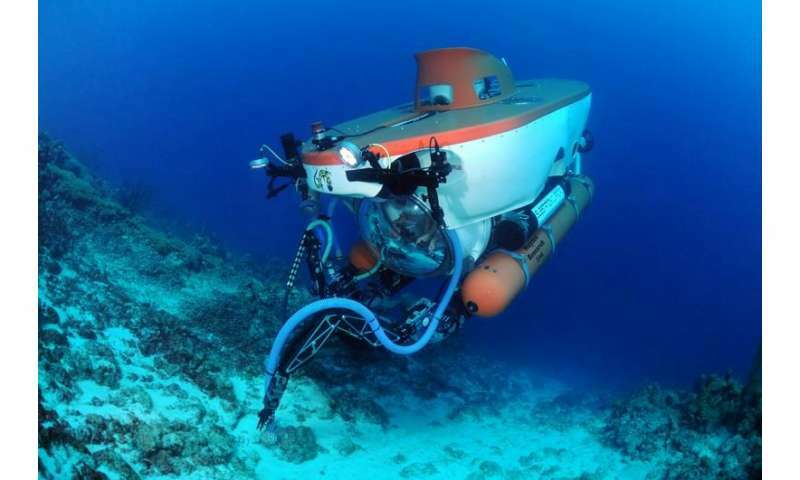 "Deep reefs are diverse ecosystems in tropical seas that science has largely missed," Baldwin explained, "too deep to access using SCUBA gear and too shallow to be of much interest to deep-diving submersibles capable of descending thousands of meters." "How incomplete is our picture of tropical reef biodiversity if so little attention has been devoted to depths just below those home to shallow coral reefs? We don't know," she admitted. "Imagine conducting a census of people living in Washington, DC, but you only survey those inhabiting ground-level housing structures. If you don't know about the people living on second, third, fourth, etc., floors in apartment buildings and condominiums in a city packed with them, you're not getting a very complete picture of who lives here. Scientists' ignorance of the biodiversity inhabiting depths within a couple hundred meters of shallow coral reefs is similar." "We know that in temperate coastal areas, some fish species are being found at higher latitudes than previously recorded," Baldwin said, "presumably a response to warming surface waters." This hypothesis poses the question whether the fish in tropics could move deeper as well reacting to the climate change. Since no historical data on the topic is available, Baldwin's suggestion is to carry on digging into deep-reef exploration. "By thoroughly investigating reef ecosystems that lie just below shallow coral reefs, describing new species, documenting depth ranges of new and known species, we are providing the baseline information necessary to detect changes in the future."